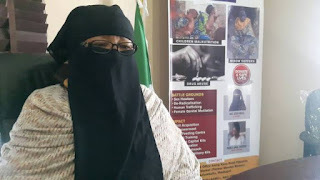 Home / News / News: Aisha Wakil aka Mama Boko Haram has reacted to the news that some of the Dapchi schoolgirls have been released by Boko Haram. News: Aisha Wakil aka Mama Boko Haram has reacted to the news that some of the Dapchi schoolgirls have been released by Boko Haram. Human right activist, Mrs Aisha Wakil has expressed joy over the release of the Dapchi school girls from Boko Haram captivity on Wednesday. The Federal Government announced the release of the girls abducted by the insurgents at Government Science and Technical School, Dapchi on February 19. The insurgents transported the girls back to Dapchi in the early hours of today. She commanded the Federal Government and other parties who contributed to the development, and expressed the hope that the remaining girls including Chibok girls would also be released soon. “I am highly elated over the release of the girls, it is a welcome development,” she said. Wakil had earlier indicated interest to work towards the release of the abducted girls. Also, Malam Bashir Manzo, the Chairman, Parents Association of the Dapchi Abducted Girls, said that they were happy over the development. Manzo disclosed that they were currently taking head count of the girls, adding most of them had returned to their homes. Similarly, Mr Maina Musa and Ayuba Alamson, parents of abducted Chibok school girls, expressed joy over the development. They, however, tasked the government to secure the release of the remaining school girls in insurgents’ captivity. “It is disheartening on our part to see that our remaining children are still languishing in the hands of Boko Haram insurgents in the past four years,” Alamson said. Alamson noted that over 100 Chibok girls were in Boko Haram captivity since 2014. He called on the international community to support the Federal Government secure release of the girls and others still in captivity. Representatives of the Chibok Parents Association had this morning paid a solidarity visit to Dapchi, to rejoice with the affected families.